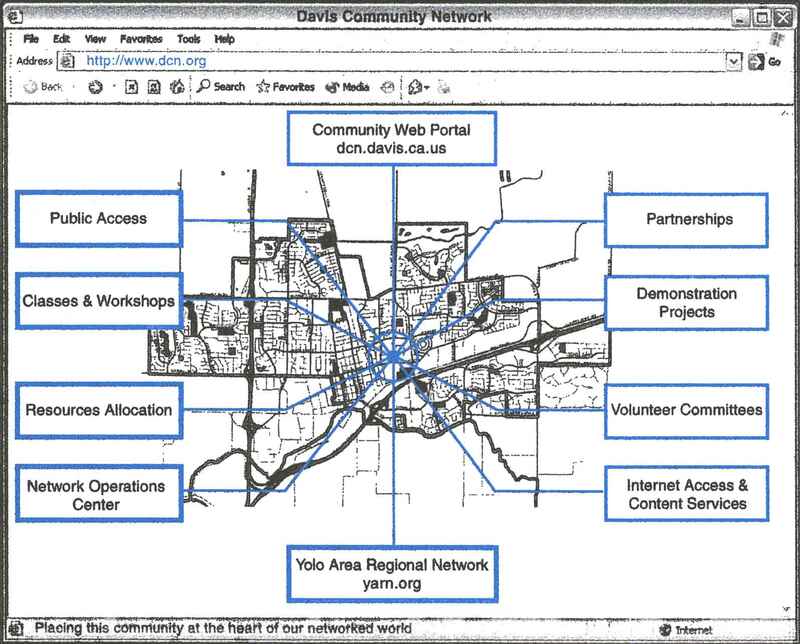 Yolo Area Regional Network (YARN) initiative, from October 1996 until July 2006. This non-profit organization has to date, received support from the University of California at Davis, California Department of Transportation (CalTrans), City of Davis, County of Yolo, Davis Joint Unified School District, Great Valley Center, Corporation for Public Broadcasting (CivNet Grant), USGS' National Spatial Data Infrastructure Program, ESRI, Inc. and the U. S. Army Corps of Engineers Hydrologic Engineering Center; and developed working partnerships with Internet provider Omsoft Technologies, Yolo County Office of Education, Yolo County Libraries, Natural Resources Conservation Service and Resource Conservation District of Yolo County, County of Yolo and regional city governments, and many other government agencies, university departments, non-profit organizations and regional businesses. DCN and YARN are tele-community initiatives which will hopefully serve as 'communities of learning and practice' within which to demonstrate 'an ecology of the information society'.